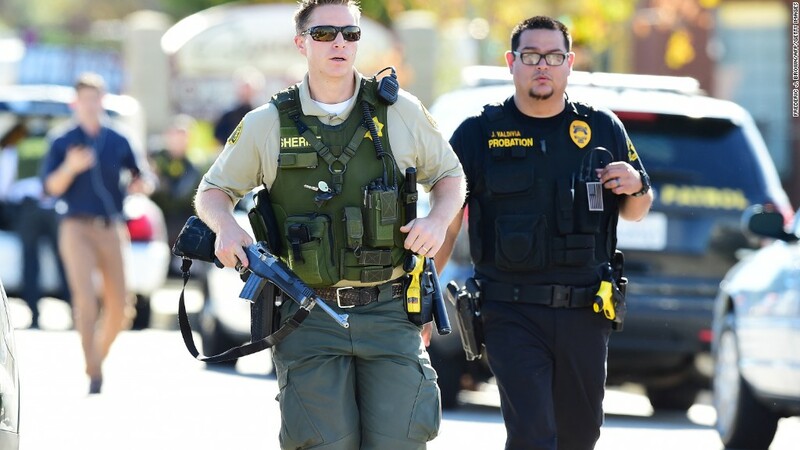 The BBC began its report on the San Bernardino, California, shooting with, "Just another day in the United States of America," but the news networks didn't treat it that way. NBC pulled Matt Lauer and Savannah Guthrie from their scheduled hosting duties at NBC's "Christmas in Rockefeller Center" due to the breaking news, according to a network spokeswoman. Other Today Show hosts Al Roker and Natalie Morales were scheduled to be joined instead by fellow co-host, Willie Geist. CNN anchor Brooke Baldwin expressed the feelings of the nation by intoning, "Here we go again" at 2:30 pm ET as she told viewers of the latest active shooter situation. CNN had uninterrupted coverage of the shooting and hunt for the gunmen through the afternoon and evening. Shepard Smith anchored Fox News' reporting throughout the afternoon and into part of the evening. Bill O'Reilly and Sean Hannity, who usually tape their prime time shows, planned live editions instead, joining the host in between, Megyn Kelly, who is usually live. At one point this eveing, Fox's Greta Susteren said, "It's just stunning that we're covering one of these shootings again." MSNBC had counted on Brian Williams to anchor breaking news, but instead its coverage was anchored by Thomas Roberts and Kate Snow. Williams was not available due to back surgery, according to the L.A. Times. President Obama, who had a previously scheduled interview with CBS News on Wednesday, reiterated a call for more gun control to CBS This Morning co-host, Norah O'Donnell. "We don't yet know what the motives of the shooters are but what we do know is that there are steps we can take to make Americans safer," Obama said. "We should never think that this is just something that just happens in the ordinary course of events because it doesn't happen with the same frequency in other countries." Reaction on social media was a mixture of sadness and anger. "I am in tears. End this. Stop this. Please," tweeted one user.